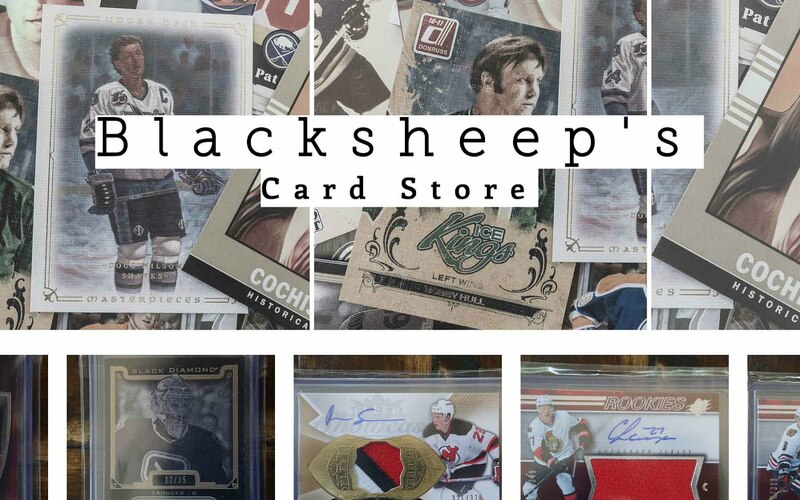 Upper Deck's main line of cards marks the real beginning of the hockey card collecting season. When Upper Deck Series One comes out, hockey collectors come in droves to purchase it. Series One is a great looking, affordable product with the potential to get some cards that have strong values attached to them. I'm excited to take a look another iteration of this beloved product. I love how Upper Deck has always emphasized great photography with a minimalistic design that just gets out of the way for the image. The same holds true with this year's set. Each card features an excellent photograph of the player with a simple, but well-designed portion for the player name, position, and team logo. Upper Deck never goes crazy with the foil on Series One. It's there to just class up the card and give it a premium feel. All the elements are just right and compliment each other nicely. In terms of card feel, each card has a nice glossy finish. Though these aren't particularly thick cards, the cards do not feel cheap in any way. Upper Deck has got the formula down pat for Series One and this year they continue to march onward with an outstanding set of base cards. The back of the base card always has an excellent design. The backs of the card are not plain in anyway. 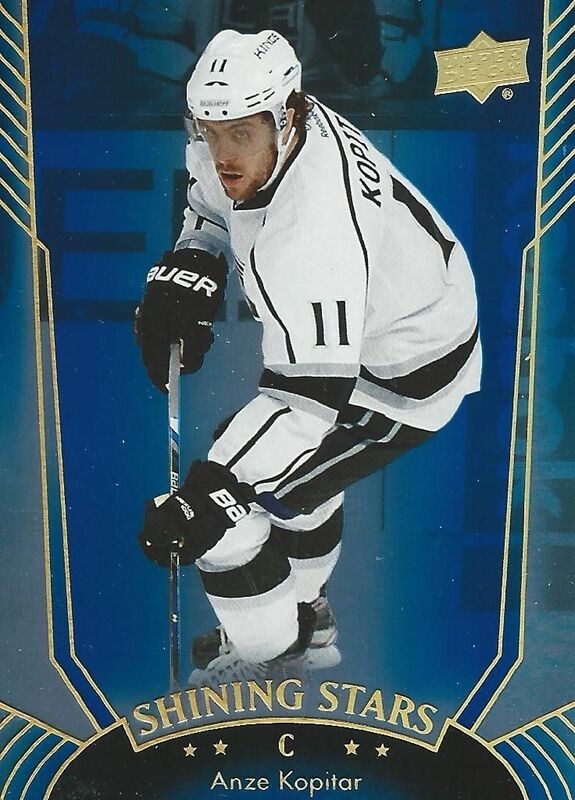 The icy look that fills up most of the card comes from the front portion of the card behind the player name. It's a sweet little tie-in that is a subtly connects the front and the back. 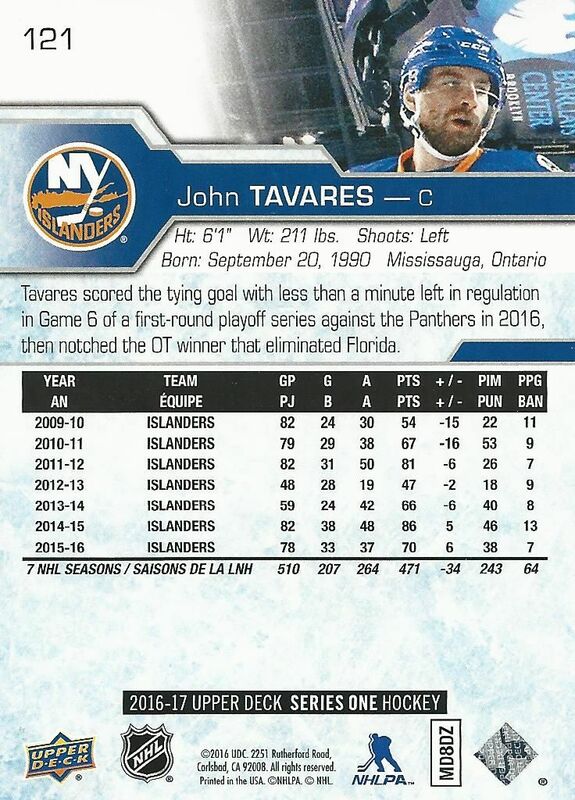 Each card has a short written section so that collectors can learn a little more about the player as well as full line of stats. 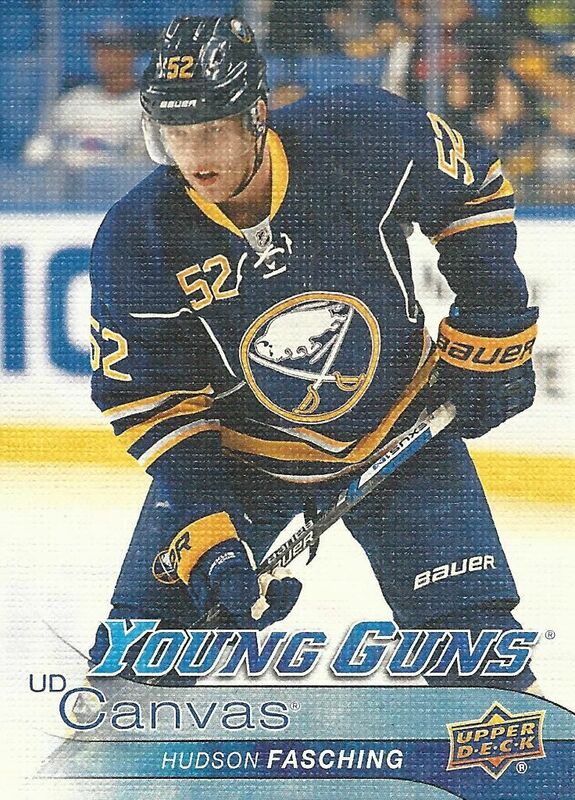 As collectors know, the rookie cards in Upper Deck Series One are called Young Guns. These iconic cards are the ones that usually define a players most popular and recognized rookie card. 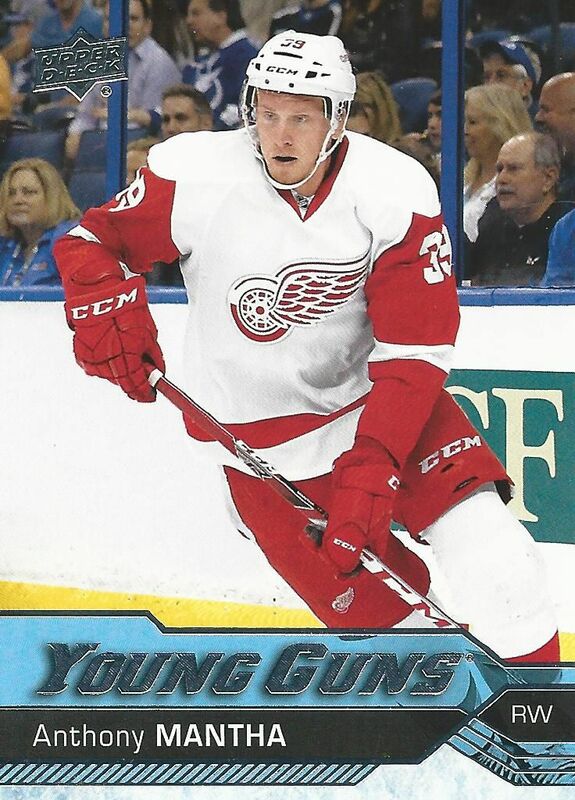 I always find the designs of the Young Gun cards fascinating. Some years are outstanding while other years are a bit more bland. The 16/17 YGs kind of straddle the middle of the spectrum to me. 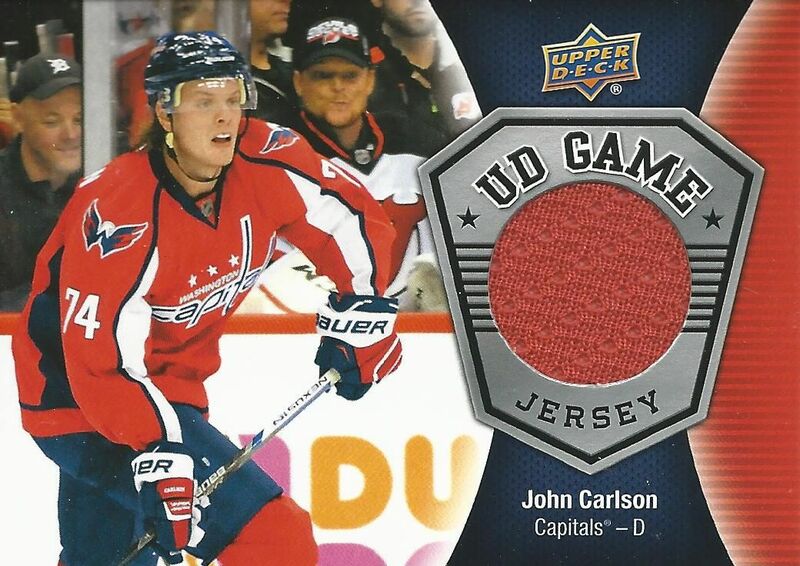 The design looks good, but it doesn't stand up to some of the more bold looks that Upper Deck has done. The font on the cards might be what's lacking for me. It looks a bit cartoonish for the rest of the design. That being said, I'm sure that won't stop collectors from chasing down the entire set! Each 24 pack box of Upper Deck is filled with the possibility of finding inserts and hits. There once was a time when boxes of Upper Deck Series One had two guaranteed jersey cards, but that's not the case here. Collectors can expect to find one jersey, but it's not guaranteed. As with all years of Upper Deck, autographed cards are also in the product, it's just that they are very difficult to pull. 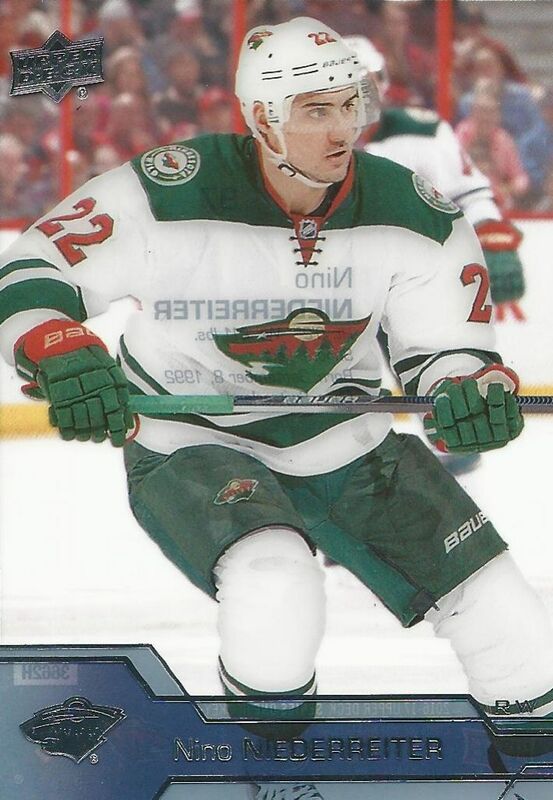 One card I was surprised to see in my box of Upper Deck was this acetate card of Nino Niederreiter. I know Upper Deck had done acetate Young Guns in the past, but this was the first of the standard set that I have seen in this form. It's a nice looking card and not an easy find. According to the box, these fall one in 72 packs. I'm sure the popular players will be highly sought after and valuable if the Young Gun acetates from the past couple years is any indication. The Canvas cards are back once again. As with all other years of the Canvas set, these cards have alternate photos that rival those of the main set. Some are even better than what you can find in the base set - and that's saying a lot! Though I love the photography, I find the design of the bottom portion of the card to be a bit lacking. Past versions of Canvas cards had an elegant look. The blue icy look is a little pedestrian. Shining Star inserts have returned. These foil-board cards have a shiny look that I think collectors will enjoy. The blue parallels are especially good looking as the foil shimmers with a rainbow brilliance. This is the type of high quality insert card that I like to find in Upper Deck Series One. 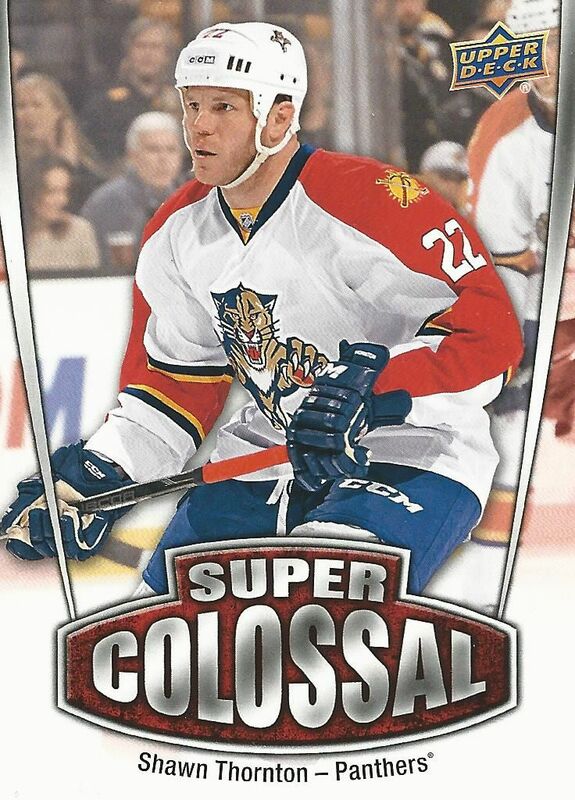 Super Colossal inserts are not of the quality I'm used to seeing with Upper Deck. These insert cards look very flat as they have no texture or foiling to them. In fact, the design is a bit cheesy. I can't say that I dislike the card... I actually find it kind of a funny looking card... but I don't think that was what Upper Deck was really going for with these. 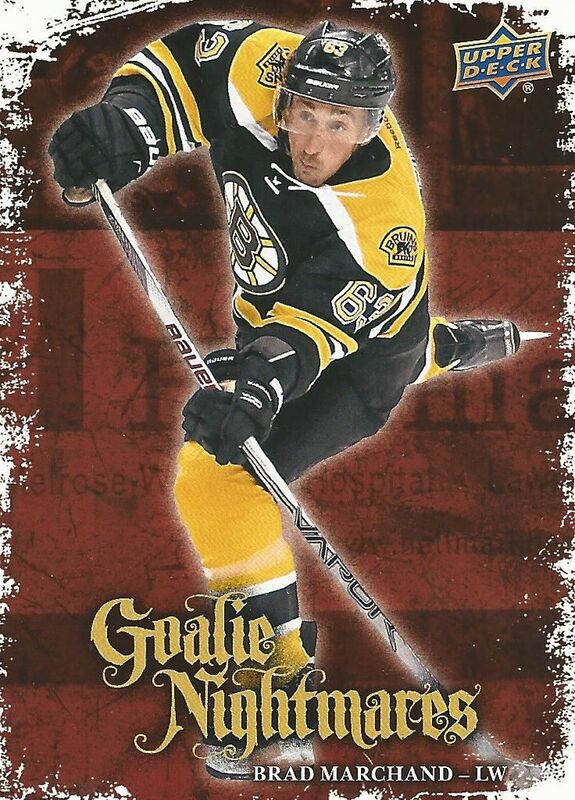 Goalie Nightmares inserts are like the Super Colossal ones. There's just a flatness to these cards that is unlike Upper Deck. And for some reason this particular insert set reminds me of something that could have come from Panini when they did hockey cards. I'm not saying Panini cards are bad, it's just these inserts remind me of some of the old Panini sets. 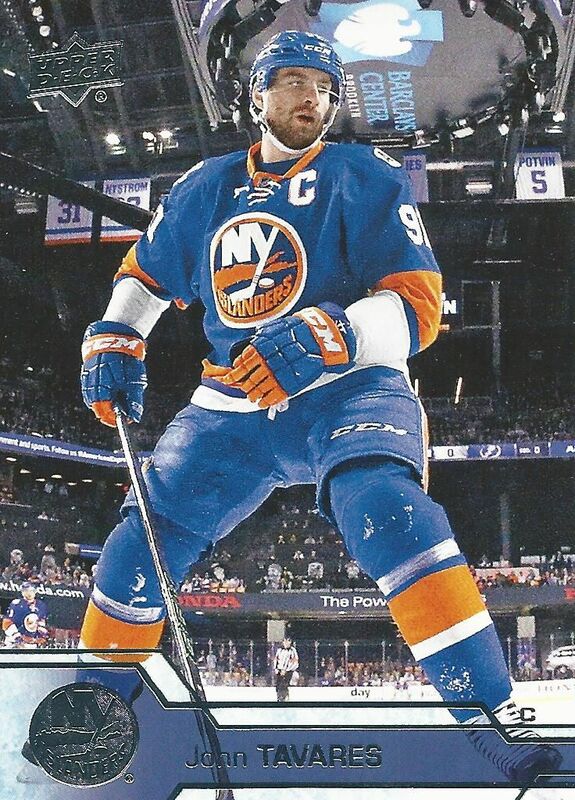 The game jersey cards this year have a nice looking, complete design, with little dead space on the card. They are vibrant and colorful and make a nice little hit to get when buying a box of Upper Deck. The jersey pieces have been getting smaller on these cards, but I feel like this year's could be a little larger? I haven't measured it, but it looks just a tad bigger this year. Each box of Upper Deck has a great number of things to pull out of it. I didn't find anything super rare from my box, but the box I opened was a good representation of what you can expect from one box of Series One. This year's Upper Deck Series One set is certainly worth buying. I'd recommend it for all hockey collectors. The box I opened up was very enjoyable as there were many great looking cards that came out as well as nice inserts to collect. The main draw from Series One is again the Young Gun rookie cards. With six per box, you end up getting a nice handful of rookies whenever you pick one up. Of course, you don't have to buy this at the box level to get enjoyment from it. Upper Deck Series One is great to buy by the pack. There really aren't that many products like that anymore. But if you see some at your local store, it can be fun just to purchase a few packs and be on your way. 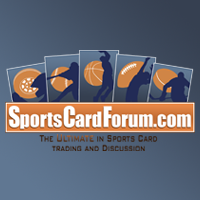 Collectors know what to expect from Upper Deck Series One year in and year out. It's a great product that everyone can afford in the hobby. It's out now so go and pick some up! I think the goalie nightmares are actually pretty funny, but the super colossals are not really cool since it's not good players... By the way, William Nylander is one of the good rookies of the year! I think Anthony Mantha too, but I'm not entirely sure about this one. Nice to see your break, as always, and continue your great vids and reviews! Great product picture wise as it is every year, but not too sure of young gun design this year. Anyways great video and review as always! I like the look of the base cards. I wish the young guns looked a little different but they're still nice. Awesome Nylander! Good box overall. Another solid break, Luke! Thanks for sharing. The photography is always on point with UDS1 (and 2). Great Review! That Nylander was sick! Nice hit with the Nylander YG! Thanks for the review. I was quite underwhelmed when I opened my box. One of my YG was damaged too. I do like the base card design and the YG cards are growing on me too. But goalie nightmares and super colossal....well the less said the better! Not a bad product this year!! I like how they added a lot new inserts, especially the goalie nightmares. Nice nylander young gun! Looks good can't wait to open a box! The new inserts have a Skybox mid-90's feel! Great review though. Looking forward to hunting Laine Canvas in S1. + As always good photography. + It seems to be "something" in every pack. 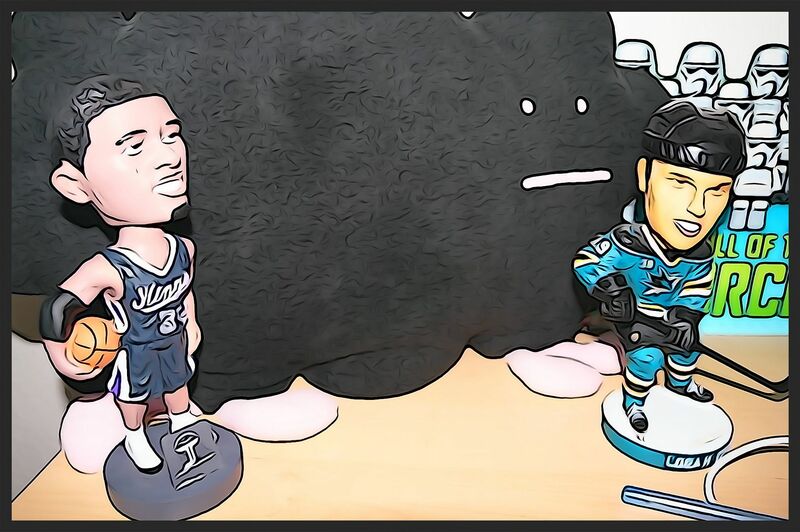 - I saw the positive reason not to guarantee two jersey cards per box, but one guaranteed wouldn't be too much. - The UD Canvas design isn't that great as it has been. Often a brown border ,or something similar to that, makes them look a lot better. I think the upper deck series 1 base cards look really nice as usual. I like that upper deck added some inserts to the hobby packs. The new design is a nice look for Series 1.
didn't like the brand at first, gotta say its growing on me! lucky for all the fasching hits I'm doing a collection on him!!! I really enjoy this product. I have always loved any year of series 1 and 2 and they didnt dissapoint.